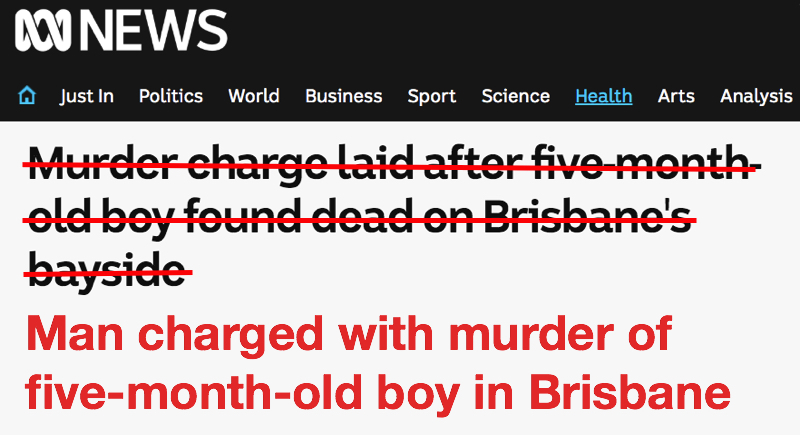 FixedIt: Who was charged with murder? The ABC reported that a 32-year-old man from Woodridge, south of Brisbane, was arrested on Monday morning and charged with murder of a five month old baby boy. No further details are available yet but The ABC chose to report this arrest under a headline that didn’t even mention the man charged with the murder. Invisible perpetrators are a constant in FixedIt. This is not a trivial issue. It matters because headlines are supposed to be a short summary of the article and when the article is about violence men commit against women and those men are invisible, the headline is not telling the story, it’s erasing the story. Also, most people don’t consume news by reading a print newspaper from cover to cover. Only some people go directly to the home page of a news outlet. Most people get news links from social media, and the most likely source is Facebook. But regardless of the source, we see far more headlines than we click on. Something like 80 percent of the headlines we see, we never click through to read the article. We’re not necessarily thinking very much about the headlines we don’t click on, but we see them. And without being consciously aware that it’s happening they are still describing something to us. When they fit our subconscious bias or when they’re underpinned myths about violence and repeat them over and over again, they reinforce them in our minds, but we don’t really notice that it’s happening. The things we don’t notice are far more dangerous than the things we do notice. Clarity in reporting and avoiding the passive voice and are among the first things journalists are taught. Which is why the constant use of passive voice and unclear reporting on violence against women stands out so much. If all the violent crimes committed by men were reported in the active voice with the perpetrators and their crime as the subject of every headline, it would be overwhelming. Because it is overwhelming. We are journalists and it is not our job to erase the truth so our audience is not made to feel uncomfortable. Our job is to describe what is happening in our society. And the sad truth is that around 90 percent of violent crimes are committed by men. Avoiding this fact doesn’t make it less true but it does make it much more difficult to address the underlying cause. Headlines matter and this is why FixedIt exists.